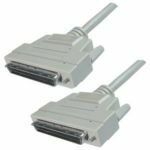 An excellent quality SCSI III (SCSI 3) cable for all-round use. Made using double shielded, twisted pair inner conductors, these cables are fully UL approved, and are RoHS compliant. Suitable for both LVD and SE usage.